I’d be willing to bet just about anything that when the subject of “classic anime soundtrack” comes up, a single from Cowboy Bebop instantly comes to mind to the vast majority of anime viewers. What’d be less certain however is which track, but for good reason: Bebop’s soundtrack isn’t just a landmark for having a couple of good songs, but an entire library of music that encompasses completely different genres, and although jazz remains right at the show’s center, it’s bolstered by having a sizable amount of variety that makes it stand out even further. Good soundtracks have personality, while all-time greats have their own identity. Apart from Bebop though, what else comes to mind? Samurai Champloo probably; another Shinichiro Watanabe production, which had an OST that was composed by the late and great Nujabes. There’s also FLCL and Your Name, both of which will be forever tied to the pop bands that had a sizable, personal influence in the creation their soundtracks, so much so that The Pillows coming back to record more music for FLCL Progressive and Alternative is arguably why so many of us are excited for the upcoming sequel seasons. And for the past few years Hiroyuki Sawano has been making a name for himself with his own style of incredible, almost bombastic scores, from the iconic Attack on Titan to last year’s Re:Creators. This year however, there was one show that caught my ear right from the first episode’s opening scene, and continued to amaze me week after week, right to the end: Megalo Box. This actually might not be too surprising at first, given how this show just oozes effort, care, and passion in almost every aspect of its production, from animation quality that was made to look like standard definition on purpose, to its characters, themes, and overall story being executed to near perfection. 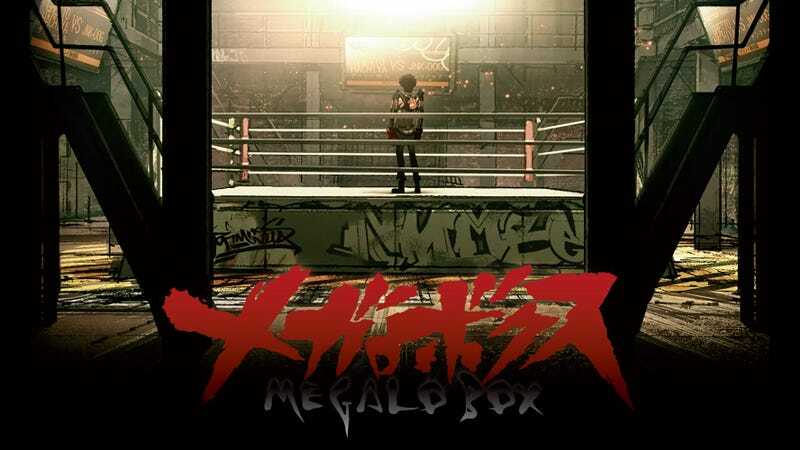 The soundtrack though, a wholly original production (albeit with an opening and ending made by two J-pop groups, as you’d expect) manages to stand out on its own amongst every other praiseworthy aspect of Megalo Box. This is thanks to the efforts of mabanua, a Japanese hip-hop producer who despite having albums dating back a decade, hasn’t really worked on an anime up to now. Don’t let this fool you though; throughout the soundtrack, mabanua cements his talent, not just by the level of quality that’s in each track, but also by the sheer level of variety there is in the OST as a whole. He’s also joined with other various collaborators, including Michael Kaneko, Shingo Sekiguchi, Shingo Suzuki, Kazuhiro Bessho, DJ BAKU, and Yosuke Inoue, all of whom come in when the score calls for something besides hip-hop. The OST goes from electronic, to latin, to rap & hip-hop, to even a few tracks (such as “Conflict (Slow)“) that sound as though they were ripped straight out of Blade Runner. And according to mabanua, this was no accident. Along with the fitting cyberpunk influence, he also noted influences such as Eminem and Kanye West, the latter of which comes through most in the track “Battlefield”, which if you listen close actually samples West’s 2010 single “Runaway” (which itself sampled an old James Brown single). A good portion of the soundtrack actually invokes Kanye when he’s at his best with musical production that, scientifically speaking, Pumps You Up. This is best heard in tracks such as “The Theme of Bangaichi” and “Get Up”, both of which are fantastic workout tracks. For a series that centers on boxing, this is as apt as you might expect. But what you maybe didn’t expect is that even during its quieter moments, and especially during its character themes, Megalo Box knows exactly when to kick things down a notch and play itself at times with an uncanny smoothness, and at others with an acute focus. The themes for Yuri, Yukiko Shirato, Sachio, and even the ones for note characters such as Glen Burroughs and Pepe Iglesias all fit their respective namesakes to a T. Yuri with its variations on what feels like a computer that’s somehow in the middle of a fight, Yukiko with its carefully composed grace, Sachio with its smooth as silk beat that ends on a tone that’s almost jazzy, and even the last two themes that go with the respective fighters’ countries of origin (a bombastic American heavy-metal influenced number, and an almost equally bombastic Latin theme). But if there’s one defining character on this soundtrack, it isn’t anyone who was in the show, but rather the artist known as COMA-CHI, who provides lyrics to what are probably the three most famous tracks on the OST: “The Slum City”, “Gearless Joe”, and “The Beast”. If you caught yourself thinking that rap was missing from the show’s diverse roster of music, COMA-CHI’s got you. I’ve no idea what the lyrics actually mean, but dammit if they don’t vibe with the tracks they’re on. Now, all of this might seem like it’s good on paper, but don’t let yourself think this is the rare case were the soundtrack is better than the show it’s made for. Like all good OSTs, Megalo Box’s is one that not only works with the show’s visuals, but punctuates, improves, and enhances the overall show to the point of perfection. Not only do the aforementioned character themes work distinctly well for the respective characters when they’re on screen, but for specific settings (such as the aforementioned “The Slum City” for Gearless Joe’s hometown), pivotal events (such as the foreboding “Change the Situation 2”), and even minor details like the short tune “Megalonia News Network”, which somehow makes a TV station’s scheduled programming sound awesome. The most unexpected track on here however still manages to fit the show surprisingly well: “The Ending”. Despite all expectations, Megalo Box ended on a feel-good episode, with a final match that ended with a photo finish, and a party that left the show on a somewhat (by comparison to the rest of the series) muted note, but was still rather friendly nevertheless. And for that, “The Ending” works exactly as it should: unexpectedly fun, slightly goofy even, but overall a high note thanks to some well placed electric guitar work. I’ll end with what has come to be my favorite piece from the OST: “Drive”. It’s the opening track every viewer hears when they start the first episode, and it comes back for one of the show’s most pivotal moments, demonstrating how the series’s music ties in perfectly with what’s happening on screen. “Drive” first comes on when Joe is lost in thought on his motorcycle in the middle of a desert, after he threw a fight: “do I stay here, or do I fight my way out?” And when it returns, it’s when Joe’s inner arc comes full circle: driving nonstop to a press event, to proclaim to the crowd and the people running megalonia that he’s not out of the tournament yet (it’s a bit of a long story). I’m still kind of amazed at just how well this piece captures Joe at two noticeably different moments in the series: trapped in inaction, and later when he’s the most committed he’s ever been. But then again, it just embodies what makes this show’s soundtrack so amazing: variety, quality, and overall outstanding production that just gets. You. Going. TGRIP is a film school graduate from Portland, OR. TAY’s resident Xbox and racing game fan, he also (part time) reviews and does opinion pieces on games, movies, television, comics, and anime. He also runs his kinja sub blog Work(ing Title) In Progress. You can follow this third person narrating weirdo on Twitter @Dennis_wglasses, and his Gamertag on Xbox Live is “Aventador SV”.